Ayurveda is an ancient form of medicine dating back 5000 years. Ayurveda translates into “life knowledge” and holds a wealth of information relating to the best practices needed to ensure a safe, healthy and energized pregnancy. So, discover more about Ayurveda and Pregnancy! If you are trying to conceive, Ayurveda suggests that the sattvic diet is ideal for increasing fertility. Sattvic foods are soothing and nourishing for mother-to-be. The sattvic diet includes items such as fruit and vegetables, dairy, mildly sweet foods and spices such as cinnamon. The sattvic diet can be carried on through to the first trimester, when the fetus goes through an intense period of growth. Roasted and ground cardamom seeds. A small pinch of the powder can be put on the tongue when sickness comes. Dry crackers. The bland taste and filling nature of crackers may ease waves of nausea. The final remedy is ginger; this can be eaten candied or sipped as tea. During pregnancy, daily gentle yoga can be energizing, while also preparing the body and the birth canal for the big day. Hip opening exercises can be helpful, but remember, because of pregnancy related hormone changes, you may find your body more supple than usual. Ensure you are mindful of this, take things slower than normal and do not push too hard to prevent injury. It is best to go to a specialty yoga class or to work with a trainer. Do not take up yoga for the first time if you haven’t practiced it before you were pregnant! Pranayama or breathing exercises can be helpful during pregnancy, not only do they work to cleanse and increase the amount of prana (life force energy) in the body, pranayama can be extremely relaxing and help mom-to-be to cope with the stresses of pregnancy. Stresses such as heightened senses, aversion to smells and foods, all the way to feelings of tiredness, sluggishness and growing pains. By following a strong Ayurvedic regimen during the pregnancy, one may steel the body ready for the natural hormone dips that come after birth. The body is intensely stressed after birth, it’s required to heal, feed another human and cope with little or no sleep. The Ayurveda foundations that were laid prior to birth can help ease this difficult transition period. Mindfulness practices can help still the mind during periods of exhaustion and can protect against post-natal depression. A strong active body will heal faster. In addition, using herbal supplements such as fennel tea, which previously helped with sickness, can now help with breast milk production. 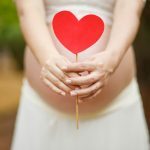 Ayurveda can provide us with a variety of tools to cope with the full journey of pregnancy, from conception to motherhood itself, not only through helping strengthen mother and baby physically, but also by helping to alleviate stress and increase the enjoyment and bliss of those precious nine months and beyond.